The first selfie taken by NASA’s InSight lander on Mars. The 11-image composite, which was released on Dec. 11, 2018, shows the lander's solar panels and deck. Atop the deck are InSight’s science instruments, weather sensor booms and UHF antenna. NASA's new Mars lander has snapped its first selfie on the Red Planet. The InSight spacecraft, which touched down on the flat equatorial plain Elysium Planitia on Nov. 26, took the selfie using the camera on its 5.9-foot-long (1.8 meters) robotic arm. The photo is a composite made up of 11 separate images, NASA officials said. Those instruments include a self-burrowing heat probe and a suite of incredibly sensitive seismometers, both of which must be placed directly on the red dirt by InSight's arm. Such a maneuver has never been performed before; all previous Mars robots have toted their scientific gear on their bodies and/or arms. It's crucial for InSight to get the placement right, so mission team members have been carefully characterizing the red dirt at the lander's feet. And there's good news in this regard: The workspace looks very accommodating, as yet more newly released InSight imagery shows. This mosaic, composed of 52 individual images from NASA's InSight lander, shows the workspace where the spacecraft will eventually set its science instruments. Image released Dec. 11, 2018. "The near-absence of rocks, hills and holes means it'll be extremely safe for our instruments," InSight Principal Investigator Bruce Banerdt, of NASA's Jet Propulsion Laboratory in Pasadena, California, said in the same statement. "This might seem like a pretty plain piece of ground if it weren't on Mars, but we're glad to see that." Indeed, it appears that InSight landed inside an impact crater that later filled with sand, NASA officials said. The soft ground should ease the digging for the heat probe, which was designed to get between 10 feet and 16 feet (3 to 5 meters) underground. The workspace photo is also a composite, which combines 52 individual images, NASA officials said. The $850 million InSight mission launched in May, along with two fly-along cubesats named MarCO-A and MarCO-B. The latter two craft became the first cubesats ever to explore interplanetary space, and they also beamed home data from InSight during the lander's touchdown on Nov. 26. 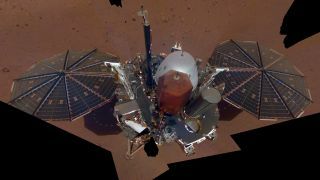 InSight's main goal is to map the interior of Mars in unprecedented detail, helping scientists better understand the planet's composition and structure. Such information should shed light on the formation of rocky planets in general, NASA officials have said. Just after touchdown, mission team members said they likely wouldn't be ready to deploy the heat probe and the seismometer suite until January or February. The InSight mission is scheduled to last one Mars year, which is nearly two Earth years.